Antique chairs, or just kitchen chairs that have been well used for years, can sometimes begin to come apart. If the legs of your chairs are wobbly, loose, or have even come off, you can usually re-glue them with relative ease. Make sure to work in a well-ventilated area and wear gloves. You may also want to put newspapers or rags down so that the wood glue doesn't damage hardwood floors or carpets. Always allow adequate time for the chairs to dry before use. Some types of chairs may have fragile legs, which will require more care. 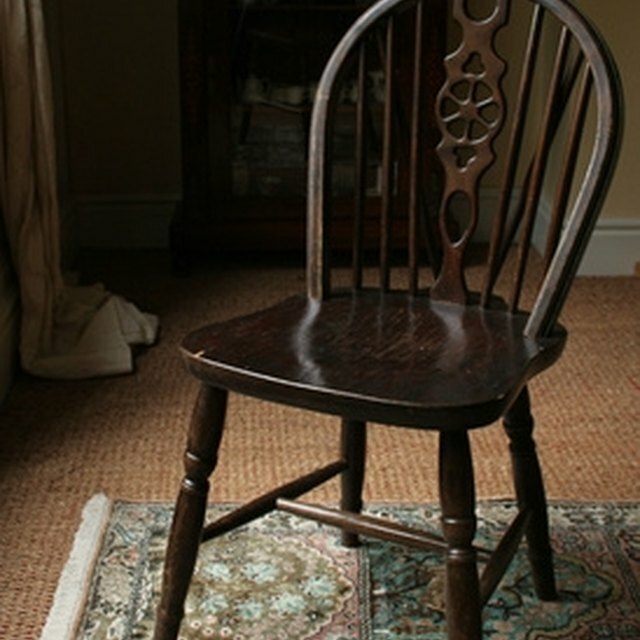 Place the damaged chair on top of some rags or newspaper to avoid scratching legs or dripping glue on the floor. Turn the chair over and remove the chair leg, if it is still attached. If there are any metal bracers, unscrew those first and keep them in a safe place. Dislodging the chair leg may require a few taps with the rubber mallet. If the chair or stretchers (the horizontal bars that sometimes brace chair legs) offer too much resistance, you may want to just leave them attached. You don't want to risk further damaging or breaking the chair. If they will not detach, but still wobble, try looping thread or rubber bands around the top of the leg and sliding them up into the hole at the seat of the chair to brace the leg. Check for excess glue around the top of the chair leg. If any hardened or dried glue remains, it can make for an uneven surface, and the chair will not attach well. Use a screwdriver or putty knife to carefully scrape off the old glue until the wood is smooth. Use the paint brush to put a thin layer of glue around the part of the chair leg that fits into the bottom of the seat. If the leg fits loosely, you may want to use silk thread to wrap the leg. Then add another layer on top of the thread. Once this has dried (allow up to 24 hours) you can add a third layer of glue and insert the leg firmly back into the seat. Wipe off any excess glue that drips onto the leg. While the glue is drying, clamp the leg to the chair if possible. If not, you can support the leg with rubber bands or brace it against a wall. Once the glue has dried, your chair should be sturdy and ready for use. Make sure to allow adequate time for the glue to dry before using the chair.